What’s new with Donatos Pizza Love Rewards? Welcome, Pizza Lover! Your rewards program is making moves. Here’s what you need to know. Earn points, get rewards. That’s it! 750 points now gets you a free pizza. Your entire order gets you closer to free pizza. Originally, the only way to get your free large pizza was to order large pizzas. Now, every salad, sub, drink, and dessert earns you points toward your free pizza. More exciting changes will be coming your way soon. 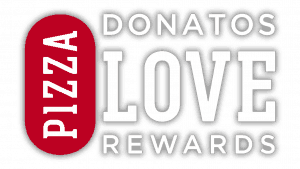 Donatos Pizza Love Rewards is just getting started! We’re looking forward to offering you even more flexibility and variety so your rewards program will be just that—yours.